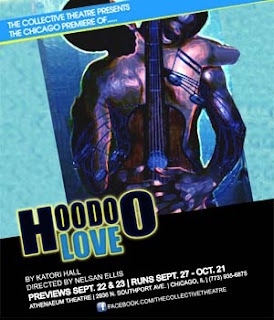 Chicago's Collective Theatre, a new company created by six friends* who attended Thornridge High School in the 90s, has made an amazing debut with a beautifully composed, aggressively staged production of Katori Hall's Hoodoo Love. It's not easy for a brand-new company to find its footing the first time out, which makes this production, directed by Nelsan Ellis, one of the founders of the Collective Theatre as well as one of the stars of HBO's True Blood, all the more remarkable. The drama, the performances and the production values are right where they should be, indicating that the Collective Theatre knows what it's doing and where it's headed. Hoodoo Love is playing inside a small performance space at the Atheneum Theatre on Chicago's north side, with a cast of ten and a detailed, atmospheric set that packs a whole lot of punch in such intimate surroundings. Ellis's direction is sure and sharply focused, with vivid stage pictures that showcase just how good his actors are. Hall's script doesn't take the easy route, either, with poetic, powerful storytelling centered on a desperate young woman living in a shack somewhere around Memphis. Toulou does domestic work washing clothes, but she wants to sing the blues on Beale Street. She also wants to own the heart of a rambling blues man named Ace of Spades who has a girl in every town the train stops. It's her desire to capture his heart and keep it forever that fuels the play's darkest moments, when Toulou turns to the neighbor conjure-woman, Candy Lady, to make her dreams come true. For one brief moment, it's all right there. And then, just as quickly, things go very wrong. It's a mesmerizing story, even as you know in your heart this isn't going to end well. And when Hall's plot takes its ugly twists and turns, there's a can't-look-away quality in the fierce performances of Lynn Wactor as Toulou and LaRoyce Hawkins as Ace of Spades, and in the stylings of Opal Demetria Staples, who takes on the role of a stylish blues singer named Lillie Mae whose songs comment on and shade the action. Staples is just plain fabulous. Her presence is one of the changes Ellis made to the Hoodoo tableau, and it couldn't be a better fit. There is a lot of music here, most of it indicated in Hall's script, but all of it makes this production of Hoodoo Love rise above. Every performer on stage -- Wactor, Hawkins and Staples, along with Tony Lynice Fountain as Candy Lady, Mark Smith as Toulou's evil brother Jib, Greg Williams and Mark J.P. Hood as Lillie Mae's back-ups, and Leon Q. Allen, Giles Corey and Thomas Lowey as a blues trio tucked into the corner -- sells the blues and deepens the drama. The Collective Theatre's HooDoo Love is an auspicious debut for a company we can only hope to see more of. "Stay with us, we're going somewhere" is the company motto. I'm thinking they're already there. Performances continue through October 21 at the Atheneum. For details and information, you can visit the Collective Theatre Company Facebook page. * The Collective Theatre founders are Francois Battiste, Veronda G. Carey, Le'Mil Eiland, Nelsan Ellis, Metra Gilliard and Jasond Jones.